Mixing opera with metal music has always been a very difficult and ambitious project. Many bands have given their own interpretation of the genre, proclaiming they have released the “ultimate” metal opera, hard rock opera, dark opera, etc. Well, in most cases the result is not that satisfying, because of lack of inspiration, inadequate technical skills, bad vocals, or unbalanced mix of the genres. Furthermore, most of them are consumed in a meaningless effort to impress! Molllust is a new German band from Leipzig, trying its luck in this demanding genre. They were born in the beginning of 2010, but it was the end of 2011 when they got a complete line-up and started their first public shows. On June 2012 they won the “BachSpiele 2012″ competition in Leipzig and finally in the end of September their debut full-length “Schuld” was released. There is something in the whole artwork, presentation and aesthetic of the band that has raised my expectations before I even listen to them. Thankfully their music is also very good! They are so different from the usual “bombastic” efforts of the genre and one of the few bands that actually play operatic metal. Their compositions are build upon the structures of classic and contemporary opera. The mastermind behind Molllust is their charismatic singer Janika Groß, who composes all music and writes the lyrics. The band succeeded to combine metal and opera in a very natural and original way. Their motto is “the heart is classic, the pulse is metal” and it can perfectly describe their music. Instead of creating symphonic orchestrations, the band chooses to “limit” its non-metal instruments to piano, electric violin and cello. They prefer clearer and more simple forms, where each instrument has its own space. Electric guitars and piano are the most dominant of them and Molllust have found the perfect balance between them, helped by their amazing production. Except for Janika’s operatic soprano vocals, there are also a few clean male vocals, as well as many instrumental parts. Their music changes from acoustic slow operatic parts, to faster metal orchestrations and all the genres in between. They have a romantic theatrical approach that reminds me somehow of Angizia’s brilliant early works (without all the extreme elements of course). All lyrics are in German and if you speak the language you can find them in the CD booklet. 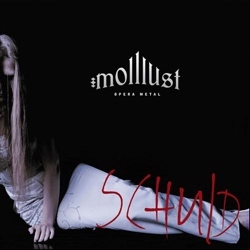 “Schuld” is one of the best opera metal albums I have ever listened to. My knowledge about classic opera is limited, but I can undoubtedly say that Molllust are great musicians. They sound rather melodic and powerful at the same time, having found a harmonic balance between these two different worlds. Their album is self-released in a professional digipak edition with 16-page booklet. If you are interested in this genre, then you must definitely visit their official pages below, listen to their music and get their album! By the way, they have almost finished their upcoming Bach EP!